For me, the wasp life cycle is interesting. But why digress into the subject of wasps? Well, although this website is about bees, it is, I think, relevant to add a little information about wasps. For one thing, it is believed that bees descended from sphecoid wasps. 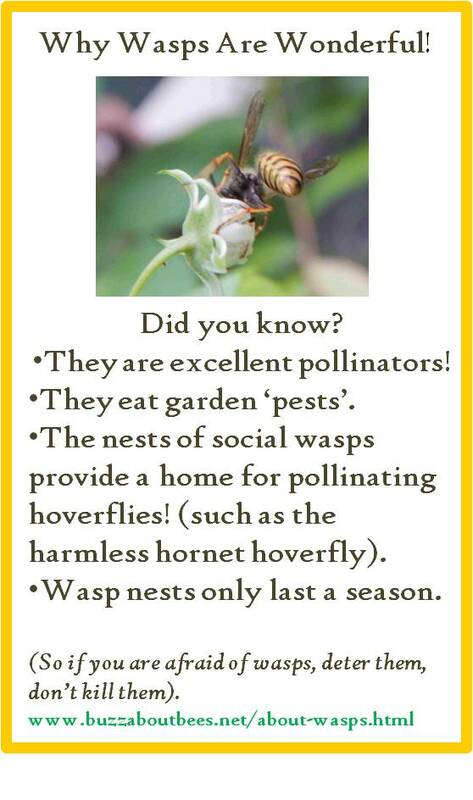 Additionally, whilst many people do not like wasps, it is worth remembering that wasps are pollinators, and they also help to control aphids and other insects known to eat garden crops. There are a number of similarities between some wasp and bee species. In fact, the wasp life cycle is short, and some wasps have similar life cycles to bumblebee or certain solitary bee species. 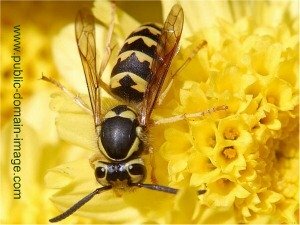 This page provides a broad description of the wasp life cycle for social and solitary wasps, but there are differences between species. Wasps are found in a variety of habitats depending on the species. The common wasp and German wasp are frequently seen around gardens and parks. Social wasps live in colonies within large nests. Nests may be underground, or may be aerial and suspended from branches, or found in the attic, and tend to resemble a paper ball. As with social bees, the colony is dominated by a queen. The wasp queen lays all the eggs, whilst worker wasps tend to the nest and colony duties, such as caring for eggs and larvae, nest building, foraging for food and defending the nest from attack, however, the queen must do the work in the early stages of establishing her colony. Hibernating, wasp queens emerge during the spring. They will have mated with males the previous year, and are thus fertilized. Their first task is to begin building their nests. The nest above was built from bits of dead wood and plant material which is chewed to form the papery walls. Inside the nest, the queen also builds egg cells, where the eggs are laid and where larvae can develop into worker wasps. Once sufficient larvae have developed into mature wasps, the queen will no longer forage or engage in general nest duties – all of which will now be left to the workers, and instead, she will devote her time to laying more eggs. Eventually, males and new queens will be produced. The queens will leave the nest, mate and hibernate until the following year. Meanwhile, the rest of the colony will die, as is the case with bumblebee colonies. The old nest will not be re-used, whereas in some cases, bumblebee nests might be used by future generations of bumblebees but only if the site is in suitable condition. As with bees, most wasps are solitary. Solitary wasp females emerge from hibernation and are responsible for constructing their nests, laying eggs and providing the larvae with food. Solitary wasps are generally not aggressive, and it is said that they are far less likely to sting. What's the purpose of wasps? The wasp life cycle is such that they are, on balance, beneficial in the garden, since they take young aphids and caterpillars that eat crops in spring, and they also pollinate plants. However, they also will eat some soft fruits, and they will attack bee nests, usually hunting for larvae. 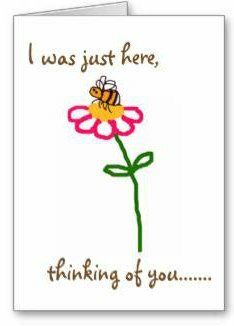 However, I have many times witnessed bees and wasps foraging on the same shrub. Nature is not wasteful, and whilst it is easy to be critical when one creature preys on another, it is important to remember that mankind is not only a predator, humans are also the biggest threat to most creatures due to their activity on the environment, and sometimes shockingly, and wastefully so. Wasps are often disliked, and may be seen as stinging insects purposely out to get humans. This simply is not true. Like any other creature, they will defend themselves or colony against threat. That threat might be you if you are waving your arms around (purposely or not). 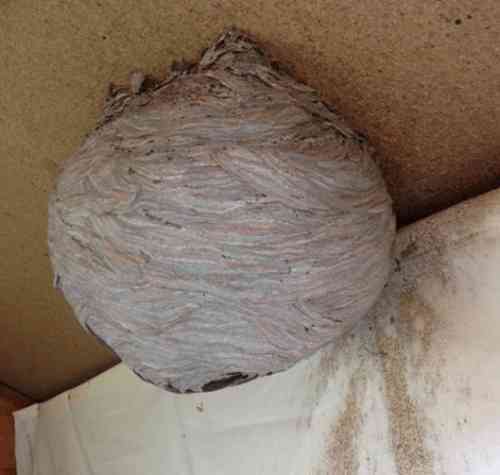 Wasps are highly beneficial insects, and as such, I would rarely recommend getting rid of a wasp nest unless it was absolutely essential (remember, they only last a season anyway)! 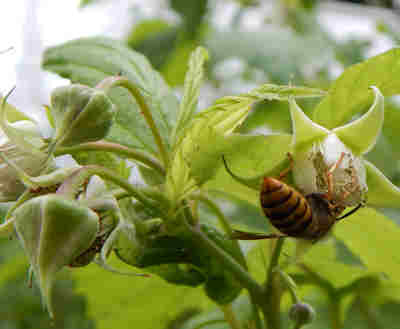 Firstly, wasps are pollinators, and there are some crops, such as figs, only pollinated by wasps. 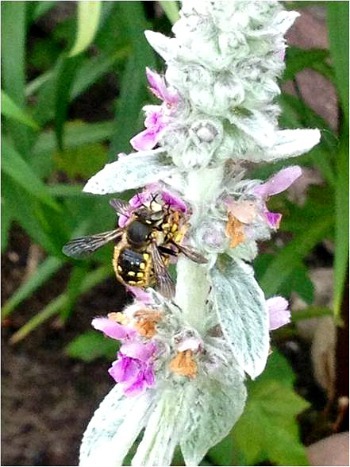 You can read more about wasp pollination here. On that page, I draw on published research as well as personal experience. Secondly, wasps are highly beneficial to gardeners, not only in terms of pollination, but also 'pest control', since they will take pest insects as food for their larvae. I personally believe it is a good idea for people to be better educated about wasps, so that we can gradually change perceptions. If you are concerned about a wasps, please see my page about how to repel them. I also created this little mini poster below for sharing on social media. Some Bee And Fly Species Are Sometimes Mistaken For Wasps! 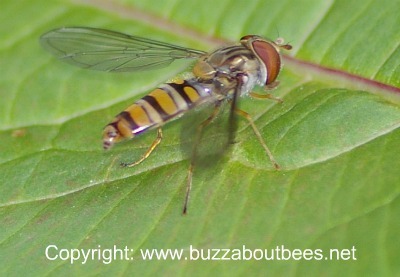 Note that some bees and hoverflies can be wrongly mistaken for wasps, although when viewing images closely, the differences may seem fairly obvious for some of the species. ...pictured below is a honey bee. 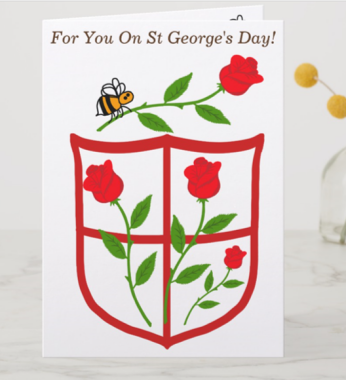 It should be noted that there is, however, tremendous variation in the appearance of wasps, and of course, hoverflies as well as bees! A summary of research into wasp pollination. Find out about wasp stings, how to prevent wasp stings and deter wasps.